FDA withdraws menu labeling guidance. Will work on rules instead. As stated in the draft guidance, certain provisions of section 4205 of the Affordable Care Act became requirements immediately upon enactment of the law. FDA also stated that it anticipated issuing the final guidance and enforcement policy in December 2010.FDA received many comments on the draft guidance and on a public docket which FDA opened to solicit comment. Based, in part, on these comments, FDA now intends to complete the notice and comment rulemaking process for section 4205 before initiating enforcement activities and will not be publishing a final guidance on menu labeling at this time. FDA is required to issue proposed regulations to carry out provisions of section 4205 no later than March 23, 2011. FDA intends to meet this statutory deadline. FDA believes that the expeditious completion of the rulemaking process for section 4205 will minimize uncertainty and confusion among all interested parties. This approach to implementing section 4205 will most rapidly lead to full and consistent availability of the newly required nutrition information for consumers. I’m not sure how to translate this. I think it means that companies currently posting calories should continue to do so. The FDA still needs time to work out some of the sticky details—calorie ranges like the ones used by Chipotle, for example. It intends to meet the legislated deadline for issuing rules a year from now. States and local communities currently requiring calorie labeling should continue to do so but should off on enforcement until then. Let’s not hurry these things. Patience is a virtue. This willl happen. Eventually. Q: I like to read nutritional information on the foods and beverages I consume. Why is there no such information on alcoholic beverages? A: You want to know the alcohol, calories and ingredients in your wine, beer and liquor? Good luck. Some alcohol drinks label some of this, but so inconsistently that it’s hard to make sense of it. The alcohol beverage industry prefers that you not think about what’s in their products. And Congress does not want alcohol marketed as nutritious. Remember Prohibition? This was the era from 1920 to 1933 when alcohol could not be made, transported or sold in America. When it ended, Congress passed the Alcohol Administration Act of 1935, still in force. Recognizing the tax potential of alcohol beverages, Congress assigned their regulation to the Treasury Department. Treasury’s Alcohol and Tobacco Tax and Trade Bureau (TTB) sets rules for alcohol labels. Absurd as it may seem, the labeling rules differ for wine, beer and distilled spirits. Substances to which people might be sensitive, such as sulfites and yellow No. 5, must be labeled, but TTB considers “ingredients” only to mean carbohydrate, protein and fat. If a label states calories, it must also state those ingredients, even though wine and hard liquor hardly have any (beer has some carbohydrate). Listing other ingredients is voluntary and some winemakers are placing ingredient lists on labels – mostly grapes, but sometimes oak products. Concentrate hard on what comes next. Labels of distilled spirits must state percent alcohol. They may list calories (but usually don’t). Wine label rules depend on percent alcohol. Wines containing 14 percent alcohol or more must display alcohol content; they may list calories (but don’t). Wines from 7 to 14 percent must list alcohol and may list calories, unless they are labeled “light” or “table,” in which case they do not have to list either. And get this: Wines with less than 7 percent alcohol are regulated by the Food and Drug Administration, not TTB. They must display Nutrition Facts labels with calories, nutrients and actual ingredients. They may disclose percent alcohol, and some do. The 1935 act prohibited beer labels from disclosing alcohol content, lest manufacturers compete to sell “stronger” products, but the ban was successfully challenged in court. Now beer labels may state percent alcohol, and when it helps sales, they do. The “energy-booster” beers associated with college drinking freely display alcohol content. Their labels also boast of caffeine, ginseng and taurine, ingredients regulated by the FDA as food additives. Calories on beer labels are equally inconsistent. Regular beer may state calories. Light beer must do so. I’m not done yet. If a beer is made from a grain other than malted barley, it is FDA-regulated. It must display Nutrition Facts; it may display alcohol. Strangest of all, regulations differ from one state to another and state rules sometimes can supersede those of TTB, but not those of FDA. Let’s credit the advocacy group Center for Science in the Public Interest with trying to fix this absurd, consumer-unfriendly situation. For decades, CSPI has petitioned Treasury to require disclosure of alcohol, calories and contents on alcohol labels. In 2004, TTB issued guidance to industry on how to voluntarily label products with a Serving Facts panel. In 2007, in response to public comment, TTB finally proposed mandatory labeling rules for alcohol beverages. These called for a Serving Facts panel listing alcohol, calories, carbohydrate, protein and fat in all beverages under TTB jurisdiction. But lest these requirements appear too onerous, TTB agreed to allow companies to leave percent alcohol off the Serving Facts panel, as long as it appeared someplace else on the label. In response, CSPI insisted that TTB delete the unnecessary fat and protein listings, include alcohol on the panel and list all actual ingredients, along with a warning statement about excess alcohol consumption. To date, TTB has neither responded to CSPI nor issued final rules. Its proposals apparently got caught in election cycles and remain in limbo. CSPI, in cutting budgets, closed its alcohol policy center last year. What to do? If you want to know calories, you mostly have to guess. Standard servings of wine (5 ounces), regular beer (12 ounces) and spirits (1.5 ounces) each provide about 100 alcohol calories. Carbohydrates add 20 or more to wine, and 50 or so to beer. Yes, those calories count, and more and larger drinks have more calories. For unlabeled alcohol, sweeteners and other food additives, you just have to hope for the best. Or you can write your congressional representatives to get TTB moving on alcohol labeling. When President Obama signed the health reform bill last February, he also signed national menu labeling into law. The FDA is now proposing rules for how calorie labeling will work in practice. The proposed rules are posted on the FDA website and in the Federal Register. The FDA is seeking public comment on its Draft guidance for industry. A statement regarding the availability of the written nutrition information. Not displaying calories at all: a “menu” or “menu board” is “the primary writing of the restaurant or other similar retail food establishment from which a consumer makes an order selection. FDA considers primary writing to include all forms of primary writing, such as dessert menus, beverage menus, or other specialty type menus. I think this means that if a restaurant has a menu board, it has to post calories on the board. If it only has menus, the calories have to be on the menus. Displaying calories in absurdly precise numbers: calorie disclosure should be expressed in the nearest 5-calorie increments for menu items containing up to and including 50 calories, and in 10-calorie increments above 50 calories, except that amounts less than 5 calories may be expressed as zero. This is fine. Measuring calories isn’t all that precise anyway. Displaying absurdly large ranges of calories: FDA will not require posting calories of variable menu items and combination meals until FDA issues a final rule. FDA will provide recommended language in the proposed rule. Uh oh. The FDA must be having a hard time figuring out what to do about this one. Displaying incorrect values for calories: a restaurant shall have a reasonable basis for its nutrient content disclosures, including nutrient databases, cookbooks, laboratory analyses, and other reasonable means. What “reasonable” means is debatable but this ought to work within a an error of 10% or so. We will have to see how this one plays out. If you want to weight in on these proposed rules, now is the time to comment. You can do this easily at Docket FDA-2010-N-0298. My latest San Francisco Chronicle column is about calorie labeling going national and what the FDA is going to have to do to write regulations that make it work effectively. Will doing something after-the-fact like this affect future food choices? Researchers: get busy! Never, in the more than 40 years since I published my first scientific paper (see note below), have I had an experience like this one. Most of the time, academic publishing is a tortuous process, fraught with endless delays, rejections, nit-picking, and humiliation. Wednesday, April 7: Figure added and Perspective published online and scheduled for print publication on May 27. Whew! Let’s hear it for electronic publishing. I think I could get used to this. Note: I know you are dying of curiosity about that first paper. It appeared in 1968 when I was a budding (alas, never flowering) nucleic acid biochemist: Nestle M, Roberts WK. Separation of ribonucleosides and ribonucleotides by a one-dimensional paper chromatographic system. Analytical Biochemistry 1968;22:349-351. Calorie labeling to go national! The impossibly impenetrable health care bill that just passed the House has one little piece of good news buried in it: national calorie labeling. The provision covers chains with 20 outlets throughout the country and is supposed to go into effect in a year or so. It also covers vending machines! These are great steps. Calorie labeling has two effects. It educates anyone who is interested to look and think about it. And it encourages chain restaurants to offer lower calorie options. See note below giving the index to this section. Cheers to Center for Science in the Public Interest, which has lobbied for years to get this into law. Note: Thanks to Ellen Fried for sending me this link to an Index to the menu labeling provision. How many extra calories cause weight gain? For years, some people – not me – have been saying that eating one extra 50-calorie cookie a day can make you put on 5 pounds per year. This calculation comes from basic math: if about 3500 extra calories make you put on a pound of body fat, then 50 times 365 is 18,250 extra calories which, divided by 3500, equals about 5 pounds. This never made sense to me. It is impossible to know how much you are eating each day within 50 calories let alone how many calories you are using in daily activities. Yet people used to be able to keep their weight steady without thinking about calories at all. This is because the body regulates weight and can easily compensate for such small changes in calorie intake or output with small changes in metabolic rate. It takes more calories to move heavier bodies, and fewer to move lighter ones. First reason: Portion sizes have increased greatly in recent years, and larger portions have more calories. Sometimes, they have a lot more. Foods eaten outside the home often have more calories in them than anyone suspects. That’s why calorie labeling matters. Labeling may underestimate the actual calories present in a food according to Tufts researchers (see this week’s Time for commentary and also see the industry response). But even so, a new study shows that labeling encourages people to cut down on food intake, at least at Starbucks. Make that two new studies: one from the Rudd Center at Yale comes to the same conclusion. Second reason: I keep hearing from pediatricians who treat overweight kids that they have kids in their practices who drink from 1,000 to 2,000 calories a day from sodas alone. I can’t judge whether these figures are correct or not, but several different kinds of studies suggest that many people today are eating a lot more calories than their counterparts of 25 years ago. Now Martin Katan and David Ludwig have done the actual calculations in a paper in this week’s JAMA titled “Extra calories cause weight gain–but how much?” Their conservative estimate is that it would take an excess of 370 calories to gain 35 pounds in 28 years. To become obese in 25 years, you would need to eat 680 calories a day more than you expended. To become 58 pounds overweight at age 17, they predict that a child would need to overconsume 700 to 1,000 calories a day from the age of 5 or so. These figures are quite consistent with what those pediatricians were telling me. By other estimates, average caloric intake has increased by 200-500 calories a day since the early 1980s, along with a 700 calorie-a-day rise in the availability of energy in the food supply (from 3,200 to 3,900 per day per capita). small changes in lifestyle would have a minor effect on obesity prevention. Walking an extra mile a day expends, roughly an additional 60 kcal compared with resting – equal to the energy in a small cookie. Physiological considerations suggest that the apparent energy imbalance for much of the US population is 5- to 10-fold greater, far beyond the ability of most individuals to address on a personal level. Rather, an effective public health approach to obesity prevention will require fundamental changes in the food supply and the social infrastructure. This is because on the personal level, prevention of weight gain means eating hundreds of calories a day less. Moving more, useful as it is, will not do the trick unless people eat less as well. On the societal level, we need measures to make it easier for people to eat less. I can think of a bunch of examples. You? What’s up with calorie labeling? So the New York Times ran a story about early research on the impact of New York City’s calorie labeling postings by fast food restaurants. The research, done by some of my New York University colleagues, looked at what customers said they were doing and compared what they said to what they actually did. Oops. Customers said the labeling made them choose foods more carefully but they actually bought more calories. So, should we give up on this idea? No way. These are preliminary results looking at what happened during the first few weeks of calorie labeling in fast food places in low-income areas of New York City. In such areas, restaurant choices are few, cheap food is a necessity, and people go to fast food places precisely because they can get lots of calories at low cost. 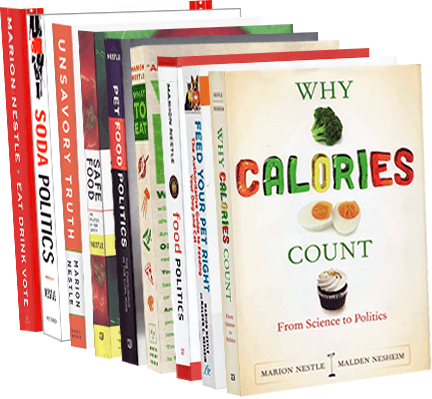 People do not understand calories very well; calorie labeling can begin the education process especially if accompanied by materials explaining that most people require about 2,000 calories a day. Some people – not all, of course – will change their behavior and choose lower calorie items when they realize how many calories are in fast food. Fast food places will reduce the number of calories in the items they serve. This last may be the most important. Just as labeling the amount of trans fat in processed foods caused food manufacturers to eliminate trans fats from their products, so fast food sellers are looking for ways to reduce the calories in their products. This is already happening and is the easiest way I can think of to encourage people to eat less: don’t serve as much.